← It’s Florida Week for the Animals: February 15-23, 2014! Great set of photos. Maybe you find more of these than most! Aw, thanks so much! I think it’s probably easier in our climate than others, heh…. Isn’t that tree just amazing? That’s one of my favorites. And it was hidden so deeply in a canopy forest — a secret. Omigosh, this is FANTASTIC! Perfection!! 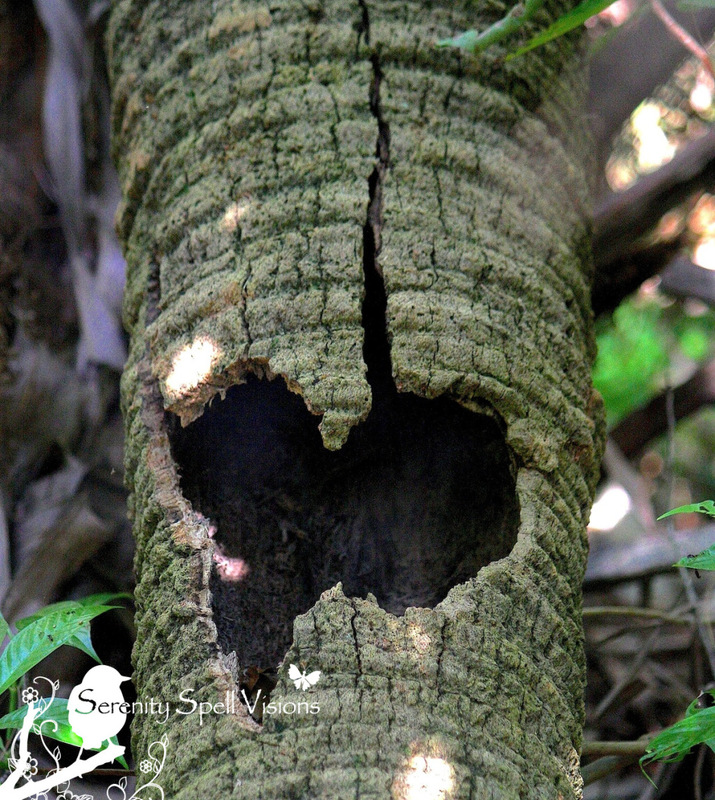 Love those pix- Do you have any good pix of Cypress Swamps w/ old growth cypress ? My apologies for the tardy reply — I get lost in the spammed content at times! Amazing, wonderful. Love to you. Aw, THANKS so very much! And right back at ya — much love to you!! Love the pairs! Why is there never an ark around when you need one? Aren’t they adorable? We’re so lucky to be surrounded by these guys!! Heh, I love it… Speaking of an ark, I just saw a trailer about Noah — with Russell Crowe! Absolutely outstanding photos! You know I love seeing our alligator friends! Heh, thank you!! 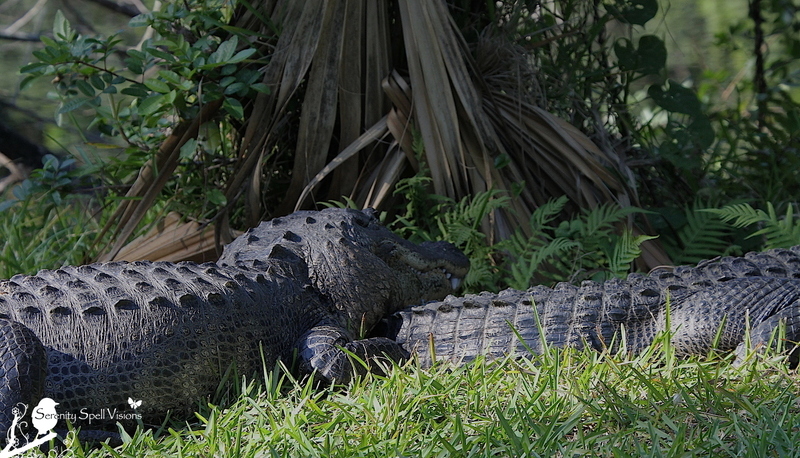 Love is in the air — and our poor misunderstood gator friends, many of them are committed couples! Look at that. Aw, thanks so much Maria! 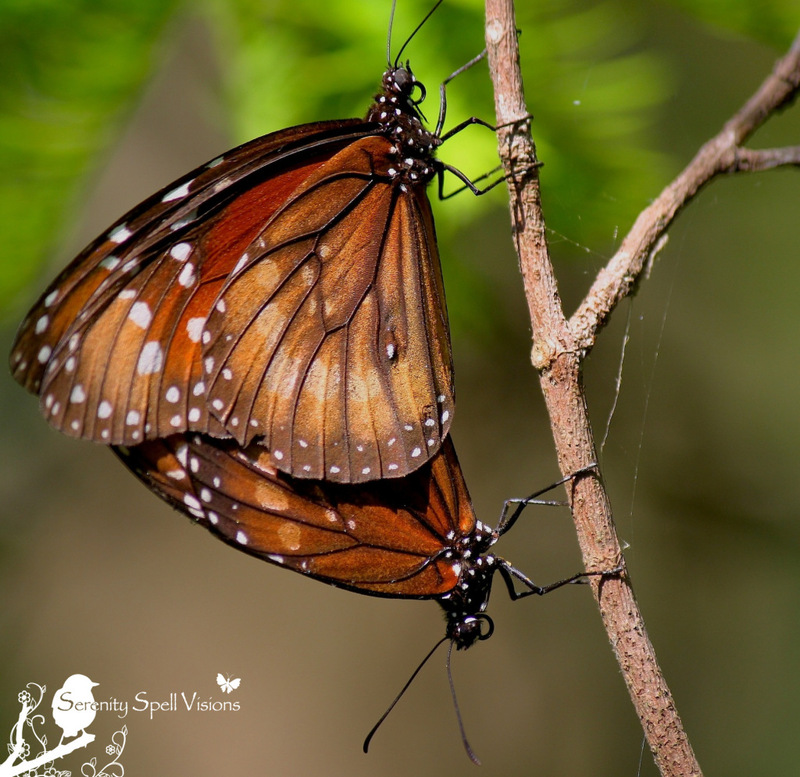 It’s so easy to find love in our natural world… So this was a fun post! 🙂 And thank you for your welcoming words. Baby steps! 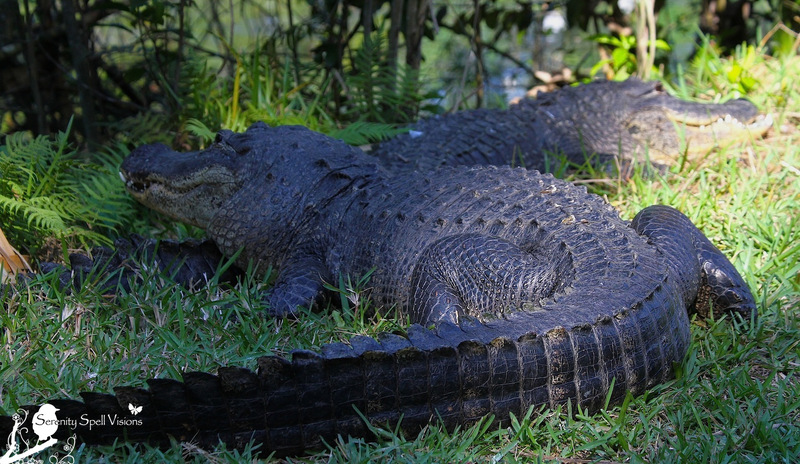 Hee… Our gators are the most easy-going critters, all year — save THIS time! (Breeding, understandably!) So this was a…hmmm… extra-careful shot, shall I say? 🙂 Mom would not have approved. Just too beautiful for words. YOU ARE A MASTER!!! HAPPY VALENTINE’S DAY TO FROM EROFEJ AND MYSELF! The bird pairs look like Audubon prints – at least, Audubon poses. They’re all so beautiful, and what’s not to love about those alligators? They make me smile. 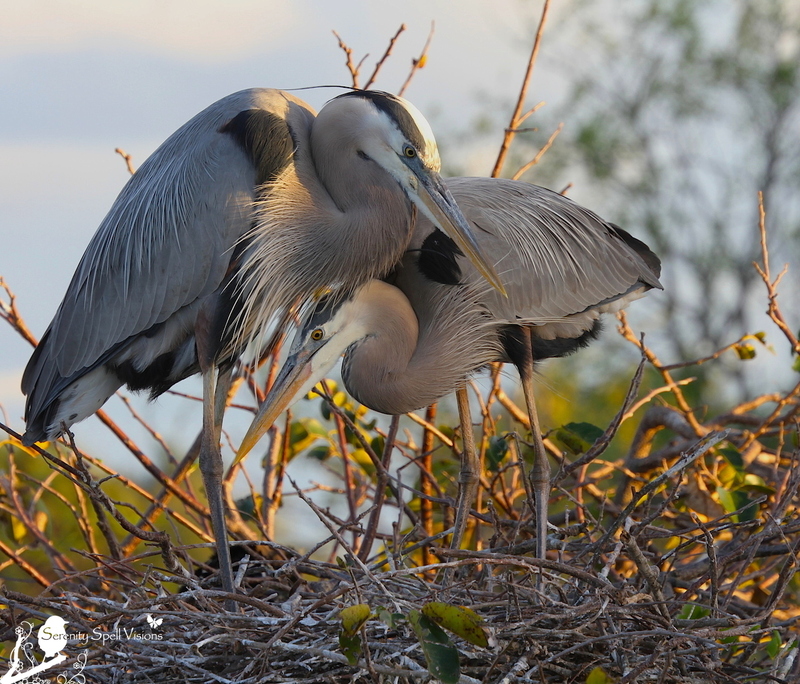 I love that GBH pose on the nest… The male and female build it together, and it really is an engineering feat. But that gator shot? Heh. Our gators are the most easy-going critters, all year — save THIS time! (Breeding, understandably!) So this was a…hmmm… extra-careful shot, shall I say? 🙂 Mom would *not* have approved. Lovely photos for this theme. Thanks so very much! It’s not hard to find such scenes down here; we’re very lucky to be surrounded by such love and beauty!! So many great shots! 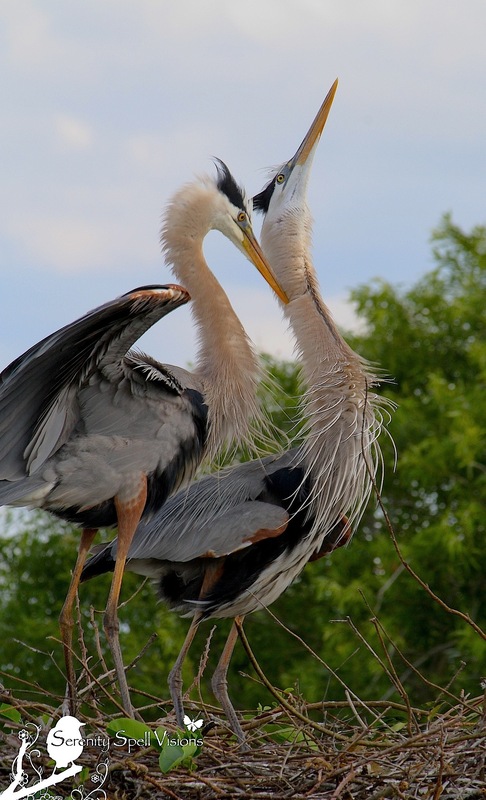 The great blue herons together are amazing. Ah, this is lovely. Thank you for sharing the love of the Everglades. You have no idea how refreshing your photographs are for my eyes right now when there’s so much gray around the Pacific NW these days. Aw, thanks so very much! I’m thrilled that the images…and critters…could bring a bit of sunshine to your gray PNW days! What a wonderful, sweet… and sadly, completely TRUE comment. THANK you, from the bottom of my (tree-hugging) heart! It really doesn’t take much to see all the love and beauty out there. But the money and politics ruling our sad state…well…. 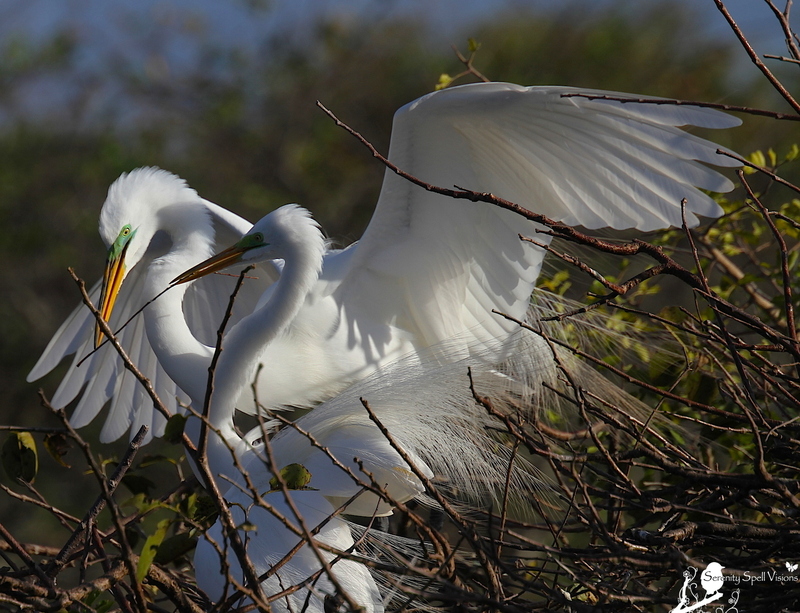 So wonderful – the white of the egrets’ wings make it the photograph seem like a flurry of angels. Each of these pairings are so hopeful – they all look so noble and devoted. What a beautiful comment… So very poetic, I just love how you say that. “Noble and devoted.” That’s how they all struck me as well.